This is a story that illuminated my heart with an understanding of how much knowledge can transform the way we live. At one time I was living in Nepal. I was in a place called Bodhanath. It was a forest with many fields around, and I was sitting, meditating under a tree. There was nobody around. It was very quiet. It was so peaceful. I was meditating. Suddenly, I heard loud footsteps that were trampling hard, and I looked up. There was an enormous European man. He was probably over 6 feet tall and his body was huge and muscular. He had gigantic muscles like boulders and mountains. One has to work really very hard to get muscles like that! Obviously, for over many years he might have been a champion body builder. He was massive, with lot of strength. He was huge. He was carrying a big bag of groceries in his arms and he was walking with hard footsteps. So I looked at him and closed my eyes. I heard screeching sound and so I opened my eyes again. There was a band of monkeys. There were perhaps twelve monkeys; I didn’t count, but it was a big group. They all went in a circle around him and they were screeching loudly. Every one of them was staring at him – eye to eye. They had green eyes and he had blue eyes. They were gazing in his eyes and he was looking at their eyes. Their glances were so full of anger. Monkeys have a few really sharp big teeth, and they were showing those teeth. They were making their lips go high up so that their teeth and gums were visible. Then they started taking little leaps towards this man, but they would not approach him; they would take a leap and then came back. I heard screeching of monkeys again and so I opened my eyes. I saw a little boy. He was a skinny little boy about 7-8 years old. He was skipping through the field and saw the monkeys with the grocery bag. He picked up a little stone and went near the monkeys. They all scattered in different directions. They ran away. They were at a distance hiding in trees, and the little boy came up to the grocery bag, sat down and started eating stuffs from the bag. All the monkeys were so scared of this little boy that they would not come near the bag. They were just watching from a distance. So I closed my eyes again and I was meditating on what is the lesson that God was trying to show me in all of this. The message that I derived was – little boy did not even weigh as much as one arm of that European man but then why were the monkeys scared of that little boy and not him? And the reason was monkeys have a very mystic power to sense fear; because they know if you fear them they can conquer you. That man may have been very strong physically, but he did not know anything about monkeys. He feared monkeys because we fear things that we don’t understand. The little boy had no muscles whatsoever in comparison and also the little stone that he picked up was nothing compared to the rock picked up by the big man. But he lived with monkey all his life. So he had no fear of monkeys. Because he was fearless, monkeys feared him. But because the other man feared, no matter what he did, monkeys had no fear of him. Why do we fear death? We fear death because we don’t really know what it is. When I cease to exist, if I do exist, where will I go? For our relatives and loved ones, do they cease to exist or where do they go? We fear death because it is something we don’t understand. But when we realize the eternal nature of soul, not only theoretically understanding – the theoretical understanding is like a map which is useful to show what is the way – but also from the words of the great scriptures and the words of the great saints, then we have to apply it in our life through our sadhana (our spiritual practice), satsang (associating with people who enliven us) and sadachar (character). When we realize the eternal nature of who we are, then we realize – na hanyate hanyamane sarire – that the soul is beyond death, and death is not something to be feared. It is as natural as the setting of the sun to end the day. And we know that when the sun sets, it rises somewhere else. Setting of sun is only in our vision. – Radhanath Swami. When we understand the true value of our eternal life and our true relationship with God (Krishna), who is our ‘suhrida sarva bhutanam’, our intimate, most loving, well-wishing friend, then not only do we not fear death but we see the inherent beauty of the whole world even though it may be temporary. We see Krishna. Krishna tells in Gita, “For one who sees me everywhere and everything in me, for that person I am never lost nor is he ever lost to me.” Devotees showed Prabhupada once a beautiful sunset over the Pacific Ocean in California, and said, “Isn’t it beautiful?” Srila Prabhupada said in response, “If you think the art is beautiful, you should see the artist!” The art disappears after some time, but the artist is forever. When we understand that we love the artist of material existence, Krishna, then we could see the permanence of his grace and beauty at all times even through all the ever-changing experiences of the life in this world. – Radhanath Swami. My eyes were closed again and I was meditating. I heard little sweet footsteps and so I opened my eyes to see that it was the little boy. He had the bag of grocery and he walked right up to me. He offered me a bunch of bananas and when he offered me the bunch of bananas, I could see all the monkeys were jumping up and down, really excited and enthusiastic. I told him, “I don’t want any banana”. I realized that I had not come to his level of fearlessness, and monkeys could sense it in me too. So I refused the bananas. He didn’t speak English and I didn’t speak Nepali. So he did not really understand exactly why I was refusing them. But I said, “No! No! No! Keep it for you; you eat them. I have so many bananas. You eat them.” He was confused about why I would not take his bananas. He left bananas next to me and happily walked away with the grocery bag. Monkeys would not come near me as long as he was there. But after he went away, I took the twelve bananas and I was thinking, ‘The monkeys look more hungry than me’ and so I offered them to the monkeys. 9 Responses to "Knowledge can transform the way we live"
Fear of death is the greatest fear for every living entity.And knowledge from scriptures can dissipate that fear.very nice story by Radhanath Swami. True. This is one of the most interesting stories by Radhanath Swami. 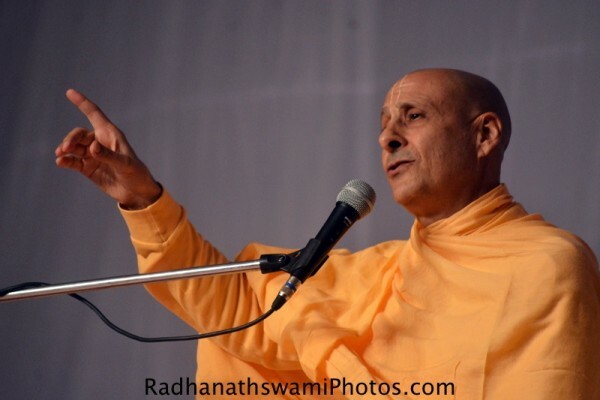 You are really fortunate to hear directly from Radhanath Swami. Me too is fearful of monkeys ;-). The message highlighted is very interesting. If we don’t have knowledge about death, then certainly we will be fearful of death. Such articles really offers peace in the heart. Thanks! A beautiful comment. Yes, death no more scares us when we understand that what it actually is and we can experience this fearlessness of death even at this stage when we only theoretically understand the process of transmigration and karma. A spiritual practitioner, being engaged in positive devotional activities is always hopeful and looking forward for death as and when it comes by Krishna’s will. Beautiful incident and the wisdom through it. The fear is simply a product of ignorance and there is no more any fear as long as we know something well. Such an enlivening nectar. Thanks. True. Radhanath Swami beautifully describes it.